How do I report Pearson's r and scatterplotsin APA style? Home > How do I report Pearson's r and scatterplotsin APA style? You will want to include four main things about your Pearson’s r when communicating results to others. 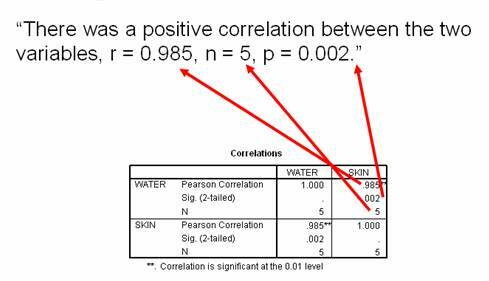 Some people refer to Pearson’s r as a “Pearson product-moment correlation coefficient” so that’s how I’ll refer to it here. If we were reporting data for our example, we might write a sentence like this. 2. Pearson’s r value and (possibly) significance values. You want to tell your reader the value of Pearson’s r so that they can understand the strength of the relationship between variables. You also might want to tell your reader whether or not there was a significant difference between condition means. Recall that some people believe you should report significance when you conduct a Pearson’s r, but other people don’t feel the same way. I am going to tell you how to report significance so that we have all our bases covered. You can report data from your own experiments by using the template below. You might want to make reference to the scatterplot that you created. The you’ll most likely want to put your scatterplot, and all other graphs, in the Figures section of your APA style paper. The problem is that no one will know they are in that section unless you make reference to them in the text. You can use the following template to reference your scatterplot. In the blank in the above sentence, you will put the Figure number. If your scatterplot is the only figure that you are referencing, you can use a 1. Otherwise, use the number that your scatterplot corresponds with. In our example, we will assume that our scatterplot is the only figure in the Figures section. For this reason, we would write the following sentence. You’ll want to briefly recap in words that people can understand. Try to imagine trying to explain your results to someone who is not familiar with science. In one sentence, explain your results in easy to understand language.